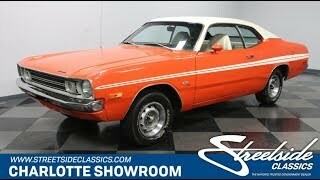 Hi, I am interested in your 1972 Dodge Demon (stock #5014-CHA) listed on Autotrader for $29,995. I'd like to get more information about this vehicle and confirm its availability. With a name like Demon, you expect this to have a powerful V8. But as you dig into all the details, youre really going to love this 1972 Dodge Demon for its cool well-preserved vintage quality, too. The Demon had one of the most aggressive A-body designs, and the factory-correct Hemi Orange paint just highlights all the angles perfectly. If you missed the curves coming off the shine of the paint, then the full-length stripe package will help guide you across the kicked-up rear fenders. Plus, the white rear panel and white vinyl roof go with the stripe to give this a well-coordinated and premium appearance. More than just the color combo, 1972 is a desirable year. Not only was it the final year for the Demon, but its also the last time the A-bodies did not have federally mandated impact bumpers - and that means something special on a car like this. The front end is far smoother and looks classically attractive, and the rear had great lines that integrated the taillights and lets the bumper follow the sheetmetal curves. The appealing white and orange package of the exterior is continued inside. Not only is this the factory correct colors, but its also believed to be highly original. So this well-coordinated total package has also been well-respected all its life. And this one really has a terrific time capsule feeling from the Demon badge in the center of the three-spoke steering wheel to the AM radio thats still on display. Plus, with high-back bucket seats, full gauges, and plenty of space for family and friends, this Demon feels far from a devil behind the wheel. When you pop the hood, youll find 340 cubic-inch V8 thats dressed to impress. The glossy blue block, matching valve covers, and Hemi Orange air topper that matches the engine bay so Mopar fans will love how this one looks like its fresh off the Detroit line. Plus, this is a period-year-correct block, so it hints towards more originality. The V8 inhales deeply from the four-barrel carburetor, and it exhales with authority from the glasspack-style dual exhaust. But more than just being a bold and mean machine, this one is easy to enjoy with a three-speed automatic transmission, power steering, and front disc brakes. Complete with owners manual, this is the time capsule coupe that has a true solid feeling all-around. So when a powerful Demon is also presented this nice, you know you need to hurry to grab this deal. Call now!